Since Alexander the Great, foreign armies have tried unsuccessfully to push their enemy out of the Arghandab River Valley. In the early morning hours of August 28, 2009 Task Force Stryker attacked into the "green zone" of the Southern Arghandab River Valley for Operation Opportunity Hold. This surprise assault signaled the first day of three major operations. During the Soviet War, a Russian Division had attacked into the same area for 34 days and could not defeat the Mujahedeen. Within 34 hours, Task Force Stryker had secured a foothold and for the next several months, continuous operations would eventually overwhelm the Taliban, and force them to relinquish the area to the Americans. Devastating combat resources were poured into the Arghandab River Valley to sustain a high tempo of brigade action. In the first major operation 1-17 Infantry, the main effort, took responsibility for the north. 2-1 Infantry, augmented with one troop from 8-1 Cavalry, assumed control in the south. 3-17 Field Artillery provided accurate and timely fire support. Soldiers from the brigade's 562nd Engineer Company waged their own war against the IED threat often conducting their clearing operations under enemy direct fire. Special Operations units frequently contributed their expertise to Stryker efforts in the valley. The brigade's Tactical Site Exploitation unit established a forward evidentiary triage location that provided prompt feedback on captured materials. The 402d BSB conducted combat recovery missions for units still in contact with the enemy. Canadian-mentored Afghan National Security Forces were routine partners and Air Force Joint Tactical Air Controllers, in a direct support role to the brigade, gave units on the ground immediate access to needed fixed wing firepower. Task Force Stryker soldiers operated daily under the aegis of the Kiowa and Apache helicopters from Task Force Saber, the Air Cavalry Squadron of Task Force Pegasus. In total there were three major brigade operations but Task Force Buffalo would conduct the brigade's day-to-day combat in the valley and faced an onslaught of harsh conditions as they struggled over the dense head-high mud walls. These obstacles, impenetrable to all but the most extreme munitions, surrounded compounds, constricted movement, and protected lurking Taliban fighters. Away from the mud-wall mazes, thick orchards and dense brush required units to frequently abandon their Strykers - and the protective armor and gun systems they carry - in favor of dismounted patrols in the exhaustive heat. The Buffalos were often joined by other members of Task Force Stryker as the brigade massed its limited resources in the area. Every battalion would contribute at least a company to operations in the terrible terrain of the valley. Mohawks, Legionnaires, Blackhawks, Blacksmiths, and Punishers would all dismount under the watchful indirect fire umbrella of the Stryke battalion to conquer the Taliban. Task Force Stryker's duty in the southern Arghandab River Valley ended in December 2009, when the brigade received a new mission in Regional Command-South. 35 Stryker Soldiers were killed in action in southern Afghanistan, 21 of them in the valley, and three comrades succumbed to non-battle illness and injury. Stryker soldiers would conduct successful operations in five of six provinces in Regional Command- South during their year-long deployment. But in nearly a decade of war against the Americans, August- December 2009 in the Arghandab River Valley was the first sustained conventional force assault - really a pursuit - that the Taliban had faced. 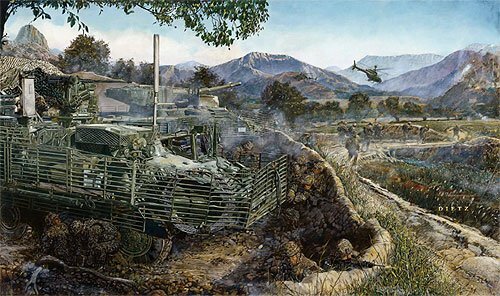 In the end, they could not withstand the determination of Stryker soldiers who dismounted and moved "into the orchards" to destroy their Taliban enemy.